The Current Radar map shows areas of current precipitation. The NOWRAD Radar Summary maps are meant to help you track storms more quickly and accurately. Yesterday's Radar Loop shows areas of precipitation for the prior day. The Forecast Radar map shows where area of precipitation are expected to be in the next 20-30 minutes. The Current Radar map shows areas of current precipitation. 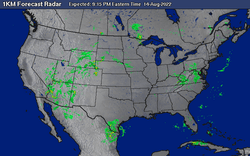 A weather radar is used to locate precipitation, calculate its motion, estimate its type (rain, snow, hail, etc. ), and forecast its future position and intensity. Modern weather radars are mostly doppler radars, capable of detecting the motion of rain droplets in addition to intensity of the precipitation. Both types of data can be analyzed to determine the structure of storms and their potential to cause severe weather. Precipitation type is indicated by the color - green is rain, pink is a mix of rain, freezing rain, sleet, and/or snow, and blue is snow. Digital radar systems now have capabilities far beyond what their predecessors only dreamed of. 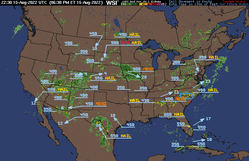 Digital systems now offer storm tracking surveillance. This provides users with the ability to acquire detailed information of each storm being tracked. Storms are first identified by the radar by matching the raw data received from the radar pulse to some sort of template, preprogrammed into the system. Once the storm is identified; speed, distance covered, direction, and Estimated Time of Arrival (ETA) of the storm are all tracked and recorded into a memory location of the radar in order to be utilized later. In order for a storm to be identified it would have to meet the definitions of a storm, as programed by the manufacturer. Otherwise, any cloud could be mistaken for a storm. Usually the storm must show signs of organization. The storm must have a core or a more intense center to be identified and tracked by digital radar tracking systems.